Take 1 tablet every 3 to 4 hours up to a maximum of 1000 mg (5 tablets) in 24 hours. ALLERGEN WARNING: Produced in a facility that also handles Milk, Soy, Wheat, Egg, Peanuts, Tree Nuts, Fish and Shellfish products. For occasional use only. Caffeine is not advisable in cases of high blood pressure or pregnancy. Not intended as a substitute for sleep. 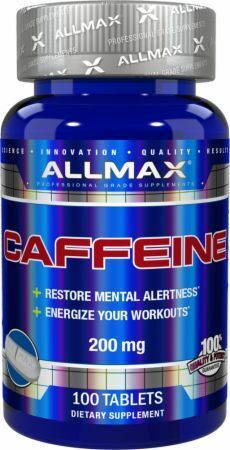 The recommended dose of this product contains about as much caffeine as a large strong cup of coffee. Limit the amount of caffeine containing medications, beverages (coffee, tea, colas) or foods (chocolate) as too much caffeine may cause nervousness, irritability, sleeplessness and occasionally, rapid heart rate. Do not use if you are pregnant or nursing. Do not use if the safety seal is missing or broken. Store in a cool, dry place and keep out of direct sunlight. KEEP OUT OF THE REACH OF CHILDREN. Not for use by individuals under the age of 18 years. 200mg This is a Buy 1 Get 1 FREE offer!